QUETTA, (BN Web Desk): Chief of Army Staff (COAS) General Qamar Javed Bajwa yesterday has welcomed Prime Minister (PM) Imran Khan at Army Aviation Base in Quetta. 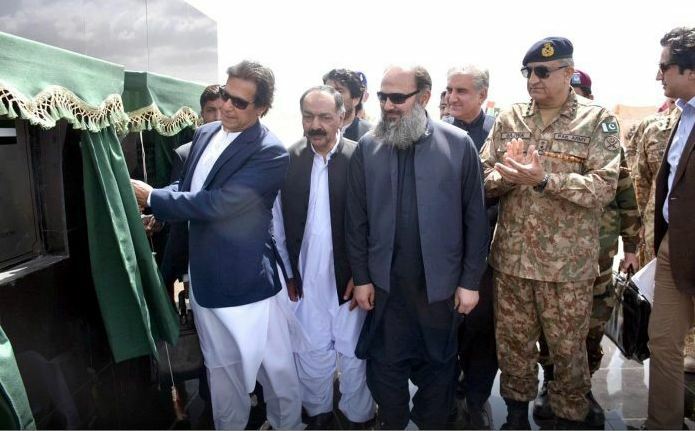 According to Inter-Services Public Relations (ISPR), PM Imran Khan along with Balochistan governor and chief minister and other key Federal ministers arrived at Quetta Cantt. PM has performed earth breaking of Balochistan Health Complex and Quetta-Zhob Road N-50 as part of western alignment China-Pakistan Economic Corridor (CPEC). Imran Khan is also scheduled to visit Gwada to lay the foundation stone of international airport. Earlier today, Imran Khan arrived in Quetta where he will preside over a high level meeting to review law and order situation in the province. Prime Minister Imran Khan will also be briefed on progress on China-Pakistan Economic Corridor (CPEC) and other ongoing development projects in the province. PM Imran will reach Karachi in the evening where he will chair the meeting of Karachi Transformation Committee. He will be briefed on the ongoing projects undertaken by the federal government. The Prime Minister will also meet traders and businessmen during his stay in Karachi. The Prime Minister will leave for Ghotki from Karachi on Saturday morning where he will meet the leaders of coalition parties.